In 1974 Dodge built 4900 of the Monaco specials that would find their place in many police squads and taxi companies from coast to coast. The newly styled full-sized 1974 Monaco rode on a 122 inch wheel base, and could be ordered with the 440 cubic inch big block. For the first time, it could also be optioned with radial tires. To support the tough demands of police work, the Monaco Police Pursuit featured a special handling package, heavy duty brakes and improved engine cooling. 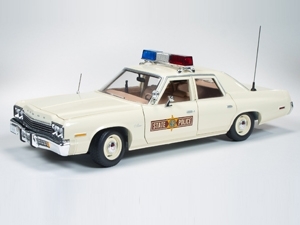 This Auto World Illinois State Police Monaco is an accurate replica of one of the police cars they would have used in 1974 delivering their reputation of integrity, service and pride.